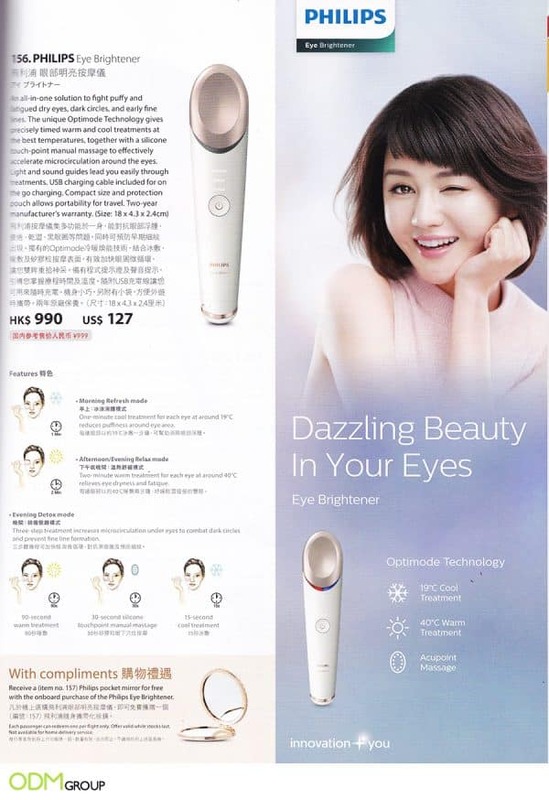 Cathay Pacific and Philips have partnered to offer an exclusive cosmetic promotional gift, a pocket mirror, with the onboard purchase of the Philips Eye Brightener. This was spotted in the July / September 2018 Cathay Pacific in-flight duty free magazine. In-Flight cosmetic promotional gifts are a great opportunity to boost sales and increase customer impulse buys. If shoppers are getting something extra in a one-time offer, they are more likely to purchase the consumer good. We like what Philips have done here as the cosmetic promotional gift compliments the product on offer – what better way to see the results of your product than a complimentary mirror? A gift with purchase is therefore a fantastic way to engage customers into thinking they are getting more for their money. Why offer a gift with purchase? Find out here! When customers are on a flight, (on route to a holiday or coming back from a business trip), they are more likely to be in a ‘treat myself’ mood than usual. Here is certainly an excellent moment to capture the customer’s attention with an additional cosmetic promotional gift or personalized promotional & marketing gift items. Increase the likelihood of spontaneous and impulse buys. A gift triggers a customer’s desire to buy your product as they believe they are getting more for their money. Giving away a custom cosmetic pouch which customers can use to keep the eye brightener and pocket mirror is also a great way to stimulate sales. Brand exposure and marketing gift set – the pocket mirror is also branded. When used by itself ‘on the go’ people are still being exposed to the Philips branding. Stimulating sales – increase in sales due to more demand for included promotional cosmetic products. Can increase the experience of your existing product while offering the customer something extra. Would your company benefit from a cosmetic promotional gift? If so the ODM Group would love to hear from you – get in contact with us today! Why not engage customers before they even get on the plane?